TBF along with FLW held the High School Southern Conference Championship on Saturday in conjunction with the FLW College Fishing Southern Conference Championship. Teams from across the region were competing and Matt Neiburg and Zach Madsen, both of Blaire, Neb., representing Blair High School, won the tournament, which was also held on Lake Dardanelle, with a five-bass limit weighing 15-0. The team beat their closest competitor, Little Axe High School/Depew High School, by 2 pounds. High School Fishing Tournaments are open to all ninth, 10th, 11th, and 12th grade students, including home schooled students that are members of the Student Angler Federation. The winning team from each state championship advances to a High School Fishing Conference Championship. Boats are provided upon request at all Conference Championships. 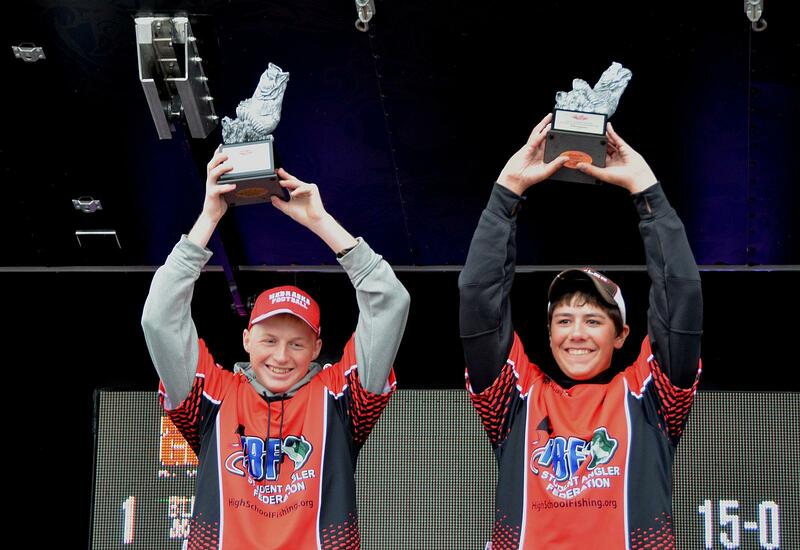 The winning team from each Conference Championship will receive trophies and commemorative jerseys, and advance to the 2013 High School Fishing National Championship, held in conjunction with the National Guard FLW College Fishing National Championship in the spring. Each member of the winning National High School Fishing Championship team will receive a $5,000 scholarship to use at the University of their choice. Teams participating in the conference championships and National Championship will also receive a travel allowance to help offset their expenses. FLW is the industry’s premier tournament-fishing organization, providing unparalleled fishing resources and entertainment to our sponsors, fans and host communities. FLW is offering anglers of all skill levels the opportunity to compete for millions in prize money nationwide in 2012 over the course of 191 tournaments across five tournament circuits, each providing an avenue to the sport’s richest payday and most coveted championship trophy – the Forrest Wood Cup. FLW is committed to providing a lifestyle experience that is the “Best in Fishing, On and Off the Water,” through a variety of platforms including tournaments, outdoor expos and the world’s richest fantasy sports game – FLW Fantasy Fishing. For more information about FLW and FLW Fantasy Fishing, visit FLWOutdoors.com or FantasyFishing.com and look for FLW on Twitter and Facebook. © 2019 Nebraska Bass Federation.